Our 65-foot club foot sailboat features a spacious 48 feet on deck, a center cockpit, and a ferro hull trimmed out with teak. She is a pleasure to sail on, comfortable and stylish, with plenty of space for up to 33 people to have a great day on the water in Puerto Vallarta. She was built in 1978 in Portland, Oregon, before sailing the triangle down to Hawaii, up to Alaska and down the west coast of Canada back home. 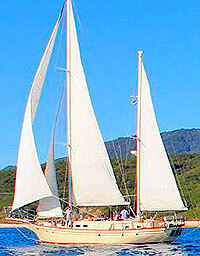 She then hit the high seas, sailing down the coast of the Americas and into the South Pacific. She circumnavigated the world at least 3 different times before finding a home here in Puerto Vallarta in 2014. Today, she is one of our most popular sailing vessels, offering all-inclusive day trips to the most exotic and famous destinations in Puerto Vallarta, from Yelapa to the Marietas Islands. She is available for 4 hour and 8 hour charters, which makes her a good choice for whale watching trips, sunset cruises and snorkeling trips as well as all-day sailing adventures. Check out the suggested itineraries below, they are a lot of fun!! Departs From: Directions will be provided with your confirmation.